Flowers Delivery Romania - Yellow, Yellow! 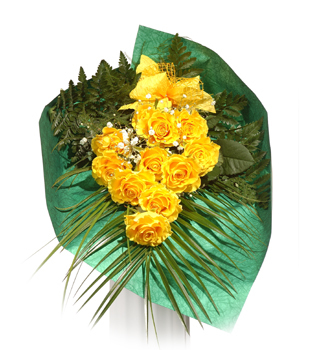 ELEGANT SIZE: 19 Yellow Roses, Gypshophila, Leather Leaf, Palm Leaf, Bear Grass Ribbon, Paper Wrapping etc. MEDIUM SIZE: 11 Yellow Roses, Gypshophila, Leather Leaf, Palm Leaf, Bear Grass Ribbon, Paper Wrapping etc. REGULAR SIZE: 7 Yellow Roses, Gypshophila, Leather Leaf, Palm Leaf, Bear Grass Ribbon, Paper Wrapping etc.